Dr. Jordan joined the Department in 1979. Initially, his research dealt with issues related to gas turbine hot section stress analysis and associated application of fracture mechanics to predict the crack growth lives of engine parts. His work has included both experimental and theoretical studies involving high temperature materials behavior and stress analysis. 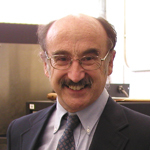 Some of his laboratory projects include elevated temperature multiaxial fatigue, constitutive modeling of single-crystal turbine blade alloys, and the development of a unique X-ray extensometer. Currently, he is involved in the development of optical methods designed to non-destructively predict remaining life in thermal barrier coatings. His main current research is the development of methods for making coatings and powders by the new process of liquid precursor plasma spray. Materials currently being developed include thermal barrier coatings, dense ceramics, optical ceramics and fluorescing seed particles for fluid flow diagnostics. Dr. Jordan also has a graduate appointment in Chemical, Materials and Biomolecular Engineering Department, is a Fellow of ASME, a member of the academic Advisory Board to the DOE UTSR program and has served as an Associate editor for the ASME Journal of Engineering Materials and Technology. Dr. Jordan was named United Technologies Professor of Advanced Materials Processing in 2010.